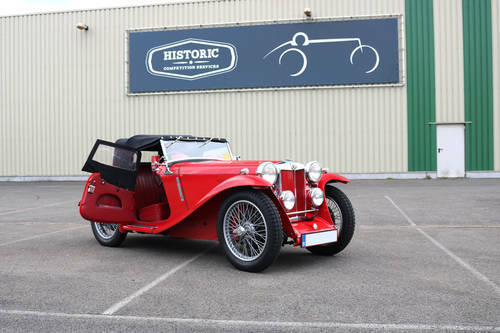 Introduced in 1935, the MG PB had the bigger 939cc engine compared to the 847cc of the PA. MG managed to design this ‘big block’ by increasing its bore to 60mm and keeping the 43mm stroke. 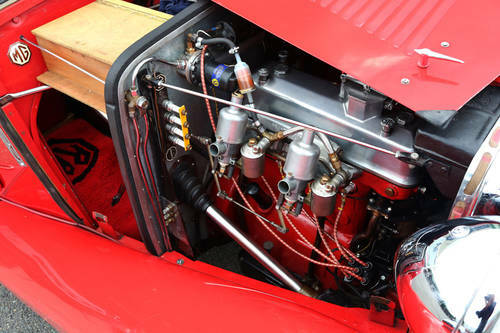 The PB also kept the double SU Carburettors of the PA, a proven setup for a four-cylinder engine. Power increased to 43BHP, plenty to throw around this 745kg car. 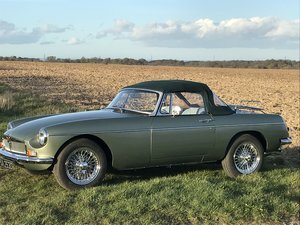 This engine with the single overhead camshaft design (SOHC) would be the last one of his kind until the MGA Twincam was introduced in the late 50’s with a double overhead cam (DOHC). 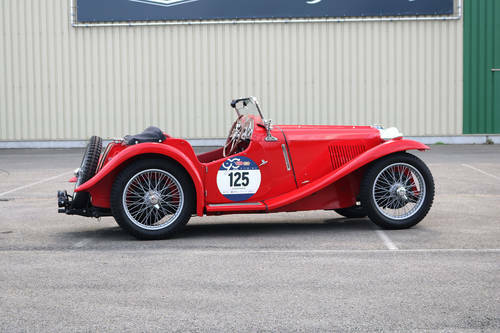 In 1936, William Morris sold MG to Morris motors which implemented that all subsequent MG products were disbanded. Many regret the discontinuation of the OHC engine, but the use of Morris parts ensured the company’s survival. With the more powerful engine, a close ratio gearbox was fitted. 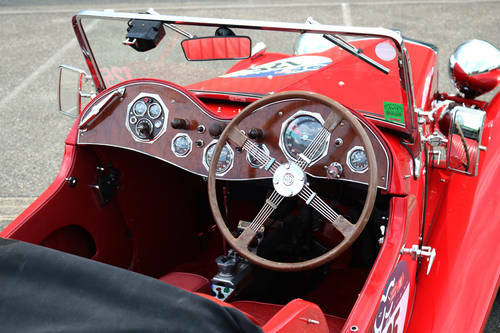 Many enthusiasts have known the setup on the J-type and were very positive with the new gearbox. 526 PB’s were constructed between 1935 and 1936 with the variety of a two-seater, four-seater and even an Airline coupe body style. Most cars were two-seaters since the four-seater variant was known for its lack of power and poor ground clearance. Design wise, not much changed between the PA and PB but with the introduction of the PB, the vertical slants on the radiator were also introduced. 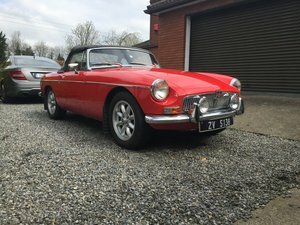 This quickly became a trademark for MG onwards. This last ‘real’ MG Midget, is incredible fun to drive. 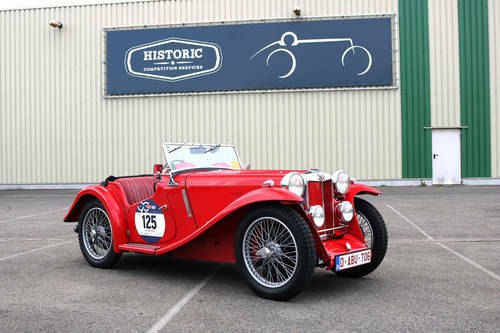 The car has been restored 10 years ago and has only done 4000km including a full Mille Miglia in last May. When the car was restored, it received a steel crankshaft, improved camshaft and the distributor was also made to fit this particular car. Shell bearings were fitted as well as modern pistons and new improved connecting rods. The carburettors and needles have been fine-tuned for the new camshaft and modern fuel. Top speed increased from 105 to approx. 130km/h and the BHP from 43 to approx. 55 making it a perfect rally car. The car comes with tonneau, foldable roof and side windows with indicator flaps. The car has been fitted with double filament sidelights that incorporate the indicators. The original octagon side lights are still present with the car. The original headlights and spotlights are fitted on the car and upgraded to H4 bulbs. 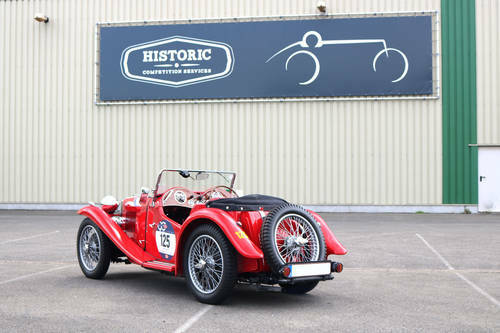 Two competition half shafts are fitted just before the 2017 Mille Miglia, the back axle/differential has been upgraded to a Wolseley 4star differential with steel casing since Wolseley used the same back axle but in steel with improved quality over MG. The propshaft has improved and strengthened including fitting modern UJ joints. Brake cables has been renewed, the brake shoes have been renewed and fitted with rivets, all assembled in the aluminium drums with steel lining. Double modern batteries are fitted with separate battery switches and the honeycomb radiator received a modern electrical fan on top of the original but optional water pump. The centre console and switch box (radiator, fog light, aux) have been retrofitted but can easily be removed without damage. Original carpets are included and can be fitted by removing the centre console, the pulse cable is already fitted to connect to your preferred trip master. The car is ready for its next adventure, may it be a nice rally on a Sunday, may it be next years Mille Miglia. 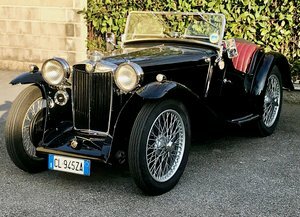 With very few to no PB entries, an A3 Fiva card and good MM Eligibility, this remarkable little giant will put a big smile on your face when you tick of the Mille Miglia on your bucket list.